I think peaches have to be the ultimate summer fruit. Every time I think of a sweet, juicy, fuzzy peach it makes me think of sunshine, rainbows and happy, carefree days. 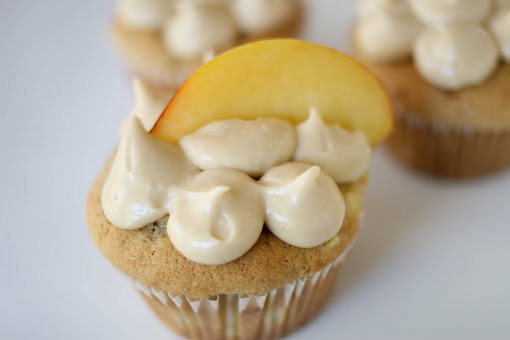 These cupcakes live up to the same standards as the peaches they were made from, and are jam-packed with all kinds of tastiness. Once I saw this recipe on Smitten Kitchen, I bookmarked it immediately. First of all, peach cupcakes? Sold. It had me at hello. 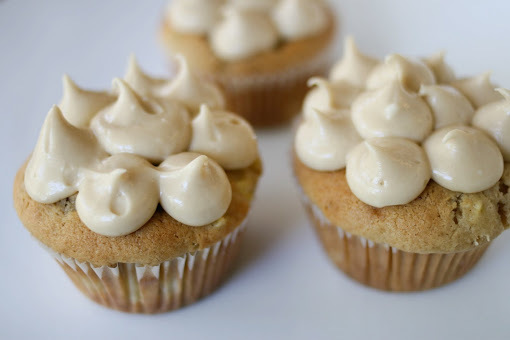 Plus, cream cheese frosting with brown sugar in it?! I had never heard of such a thing, but since brown sugar is one of my first loves, I knew it had to be one of the best things on the planet, and guess what? It was. These cupcakes are beyond amazing. The cake is nice and moist and has great flavor while the frosting is seriously out of this world, especially if you have a hankering for brown sugar. The only strife I have is probably that the peach flavor isn't prominent enough. Actually, my friends said if they didn't already know it was peach they wouldn't have guessed it but that they were so delicious anyway, they could care less. I think that's a win if I ever did see one. Preheat oven to 350 F. Line a cupcake pan with liners and set aside. Sift together the flour, baking powder, baking soda, salt and nutmeg, set aside. Cream the butter and sugar together, beating until fluffy. Add the eggs, scraping down the sides and bottom after added. Then add the vanilla, and gently mix in the buttermilk/ sour cream/ yogurt. Stir in the dry ingredients and fold in the peach chunks. Divide the batter evenly among the cupcake tin, about 2/3 full. Bake for 18 - 22 minutes or until an inserted toothpick comes out clean. Cool for 5 minutes in the tin then transfer to a wire rack and cool completely. 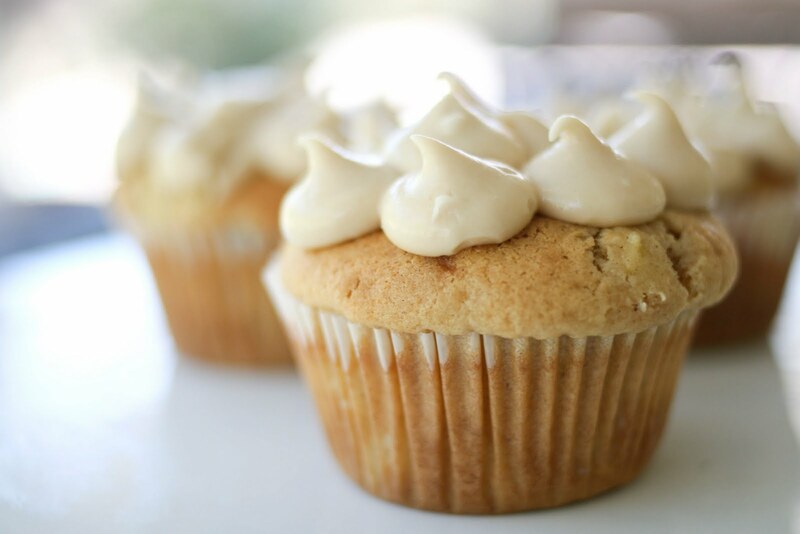 To make the frosting, in a small bowl whisk together the brown sugar, cornstarch and powdered sugar. In a large bowl, beat the butter and cream cheese until fluffy. Add the sugar-cornstarch mixture and vanilla, beat until frosting is smooth and light. Chill the bowl in the refrigerator until it thickens up a bit, about 30 minutes, then spread or dollop onto the cooled cupcakes. I get so excited when peaches come in season!! These look super delicious! Yum. This combination sounds (and looks!) absolutely amazing. Definitely a winner, or will be for me as soon as we get some decent peaches around these parts. Is there anyone in their right mind who doesn't love brown sugah? I hope not 8). ohh man I think you just stole my heart! i absolutely love peaches. can you send one my way?